Books have been deemed one of the most valuable kinds of art objects in the history of mankind due to their ability to contain some of our most cherished cultural and personal thoughts and ideas. The value of books has been evidenced by their ability to command extremely high prices at art auctions, including the c. 1180 Gospels of Henry the Lion, an elaborate work made for the Duke of Saxony and Bavaria, which sold in 1983 at a Sotheby’s auction for a record £8,140,000 (approximately $15,000,000) to the German government. It held the world record for the highest price ever paid for an art object until three years later when Van Gogh’s Sunflowers was sold. It was the Leicester Codex, a bound manuscript of Leonard da Vinci that fetched a record 30.8 million dollars, the highest price ever paid for a book when it sold at auction to Bill Gates in 1994 (Baer, n.d). The value of books transcends their material worth and ability to command high prices at art auctions. Books are highly valued because they provide spaces for sacred texts, illuminated scriptures, transfers of knowledge, and recordings of personal and communal narratives across generations. They hold individual, community, and cultural legacies and create cultural bridges over time and people. Myths are collective stories; myths are our personal stories. Myths carry historical knowledge and personal details. The stories we tell about our lives, of the events and people, of the sensations and emotions, are the myths we create in order to tell us who we are. Narrative is how we understand the world as it is intertwined with emotion, context, and imagery. Memory is construed and recalled through a narrative framework and is plastic and flexible in the telling and retelling of a story. Emotion, memory, and story combine to create a truth, even if it is a fictional truth. Body sensations are empathically experienced when telling or listening to an experience, even if not as profoundly as originally experiencing the event. We have visceral reactions to the telling and the witnessing and re-witnessing of a story. We create internal images for the story as it is told. Author Siri Hustvedt (2011) said, “Writing fiction is like remembering what never happened.” Memory and imagination partake of the same mental process as emotion and are central to storytelling in literature and psychoanalysis (Hustvedt, 2011). Memory and art are inexorably entwined. Remembering is not the same as perceiving because we need concepts, context, and language to name and to bring to mind images. These mental images are now popular in neuropsychological vernacular and are called neural representations. Within the image are mythical stories. Myths create balance, clarity, and adjustments, making events correspond to the inner necessities of things. The tension between dichotomies—good/evil, black/white, positive/negative, active/passive—gives ambivalent power. The psyche is often invisible without awareness of mythological images because, without them, we are unable to manifest the psyche’s origins, structure, and transformations. 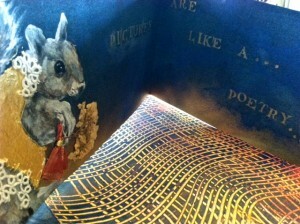 The myth, or story, gives voice to the psyche; the book provides a vessel for the voice. “Great books endure because they help us interpret our lives” (Olmert, 1992, p. 299). They offer solace by our knowing so many have come before us and written down their experiences. Ordering & organizing – chronological order storyboarding. Myth-minding – refers to the ability to think freely, to know what we know, and to know what we do not yet know. Books have the ability to promote myth-minded thinking and development. Like other forms of art, they provide a place for projection and objectification. Books provide a place for recollection, mirroring of life’s events, and memories, as in their unwavering ability to concretely recall past events and provide a life’s retrospection. Through creative narrative picture making and writing, a book can tell and retell a part of a life story. The value of a book that has endured the ages remains unfettered by time; it is a permanent record, an archival account, of aspects of the psyche that live on beyond the life of the individual. In addition, books offer containment. 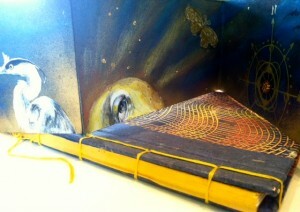 They have covers and pages that can be opened and closed as one desires. Contents can be revealed or concealed by a flip of the page. Additionally, books offer order and a built-in organizing device as most books move in a sequential fashion. Pages turn, one preceding after another. The complexity of order can be increased by adding pockets or additional foldout flaps and signatures to the book, but it still has an order. In telling our story in a book created in therapy, through images and words, we make the truth of our thoughts, our words, and our images known and seen by us. This is a way of recollecting and retelling our struggles and triumphs. It is a way of mirroring our life contemporaneously and a way to be nostalgic about memory that we recall from the past. 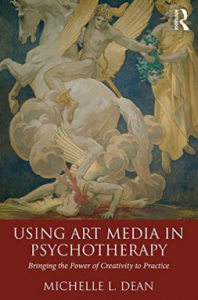 For more information about using book arts in therapy, see Using Art Media in Psychotherapy, Bringing Creativity to Practice.